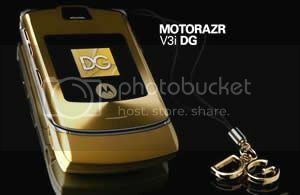 Following on from the sensational gold Motorola RAZR V3i by Dolce & Gabbana, the stylish Italian creators have designed with Motorola, a new version of the V3i phone in lavish gold and silver. The gold MotoRazr V3i features an engraved Dolce & Gabbana logo on the front and comes complete with a unique pendent featuring the gold D&G initials. The new gold RAZR phone provides further tailored features, such as special backgrounds, screensavers, MP3 ring tones and unique animations. The gold RAZR V3i will be accompanied by matching accessories which can be purchased separately, these include a personalised Motorola H700 Bluetooth headset, a wired stereo headset for listening to MP3 music files and an extravagant gold leather phone case. The gorgeous new gold Motorola RAZR V3i by Dolce & Gabbana makes a bold contemporary style statement, and will be available to buy worldwide from June 1st 2006, at selected Dolce & Gabbana boutiques and major Motorola stockists, price unknown, probably a lot!